It’s Jan­u­ary and like so many of us I am think­ing about my New Year’s res­o­lu­tions. One of mine is to get into bet­ter shape. 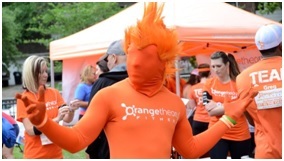 My wife is a big sup­port­er of this goal, and she bought me a mem­ber­ship to a new gym in Pittsburgh’s East Lib­er­ty neigh­bor­hood called Orange The­o­ry Fit­ness. They run 60 minute car­dio- strength class­es. The Orange ties to the ide­al col­or on the heart mon­i­tor col­or spec­trum where par­tic­i­pants get the ide­al work­out – not too intense, not too gen­tle. And here’s the big pay­off- exer­cis­ers who stay for a cer­tain num­ber of min­utes in the orange dur­ing the work­out con­tin­ue to burn calo­ries up to 36 hours after a work­out. What’s not to like. The Mar­keter in me is impressed with the con­sis­tent and on-tar­get brand­ing through­out the busi­ness. Every­thing fits togeth­er well- from the col­or tones to the mes­sag­ing to the mon­i­tors. The core col­or Orange ties to one of firm’s big ben­e­fits – high calo­rie burn both dur­ing and after the work­out. Those peo­ple in oraange below are max­i­miz­ing their work­outs. The styl­ized “O” in Orange also por­trays activ­i­ty and for­ward move­ment. I have been crit­i­cal of oth­er logos (see post), but this one does pret­ty well. One sug­ges­tion about the firm’s long name: I would cut the word “the­o­ry” — it’s not need­ed. The col­or ties to the work­out space, sig­nage, mer­chan­dise, and pro­mo­tion­al items. At the end of the day, the suc­cess of the busi­ness will be pre­dom­i­nant­ly deter­mined by sat­is­fied cus­tomers who feel that they are get­ting the work­outs (and calo­rie burns) they seek. Yet busi­ness has start­ed well as the brand sto­ry and prod­uct fits well togeth­er.